Hasbro’s DohVinci Play-Doh sets have enabled kids to create their own great designs that are unique to them. The DohVinci Spotlight Spin Studio takes this idea to new levels and lets children create the most amazing projects in flat or 3D styles. The set comprises a motorised platform that spins around as you squeeze the Play-Doh from the Deco Pop tubes. Six different colours are included to start you off as well as a Styler tool. Five projects are included to start children off, and once they have achieved these they can then create their own unique masterpieces! Once finished, each design can be illuminated by any one of four different flashing light shows. This is arts & crafts at its best and is suitable for children of 6 and over. Extra Deco Pop tubes are available to keep creating works of art using the DohVinci Spotlight Spin Studio. 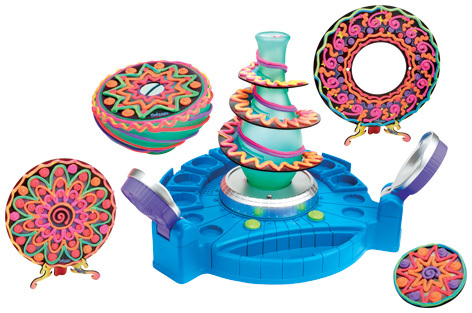 Please tell us what you think of the DohVinci Spotlight Spin Studio by Play-Doh and Hasbro.